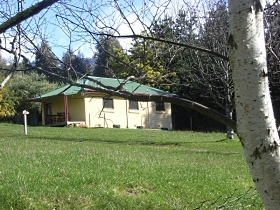 chalet located in Central Mole Creek, Tasmania. 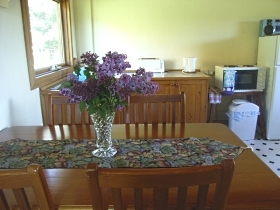 Welcoming, hosted B & B accommodation in a secluded, beautiful location, nestled in the foothills of the Great Western Tiers. Features 2 spacious ensuite rooms with queen beds (1 with extra single bed) sleeping a total of 5 guests, a guest lounge with everything for your comfort, incl free wireless internet, and a huge deck, all on the second floor of the lodge which is set aside exclusively for guest use and has a private entrance. 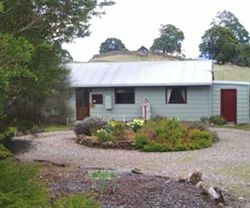 Cottages located in Central Mole Creek, Tasmania. The Harvey Family would like to welcome you to their little slice of paradise situated on the edge of the Tasmanian wilderness. 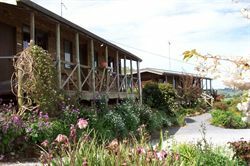 So when choosing that exciting new destination for adventure or just to relax, remember Mole Creek Holiday Village is one of Northern Tasmania's premier places to holiday. Welcoming, hosted B & B accommodation in a secluded, beautiful location, nestled in the foothills of the Great Western Tiers. Features include 2 spacious ensuite rooms with queen beds (1 with extra single bed) sleeping a total of 5 guests, a guest lounge with everything for your comfort, incl free wireless internet, and a huge deck, all on the second floor of the lodge which is set aside exclusively for guest use with its own private entrance.Mole Creek Lodge is a picturebook two storey, all timber home, situated on a 6 acre rugged, rocky, forested property, and fitting perfectly into its surroundings. Your accommodation looks out over the adjacent Mole Creek Karst National Park, forests, mountains and rolling hillsides of farmland. Watch the birds and listen to their song, perhaps spot a wombat, an echidna or some other visitor foraging in the grounds (it's hard to miss the possums and pademelons when night falls!). The pretty little town of Mole Creek is ideal for a stopover, a relaxing getaway or as a touring centre for the central north area of Tasmania. 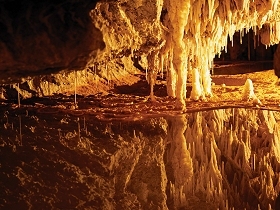 Close to Deloraine, Mole Creek is on the scenic route to Cradle Mountain from Launceston and Devonport. Wonderful walks abound for every level of fitness, to features which include Alum Cliffs, Devils Gullet, Westmorland Falls, Liffey Falls, and the wonderful Walls of Jerusalem National Park; nearby are the celebrated Mole Creek Caves and Trowunna Wildlife Park, and food lovers will enjoy sensational tasting opportunities. Your stay with us might include dinner in our licensed woodfire heated restaurant. The menu reflects the finest of Tasmania's fresh produce and wines. Our cafe provides the best coffee in the valley and delicious all day refreshments. Enjoy cosy movie nights in our home theatre featuring a large format screen and great surround sound. Self contained chalets set in beautiful cottage gardens. 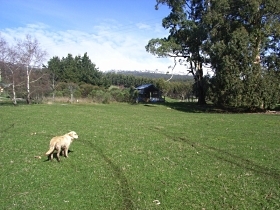 Springfield Deer Farm cottage accommodation is near Deloraine, Cradle Mountain, limestone caves at Mole Creek. 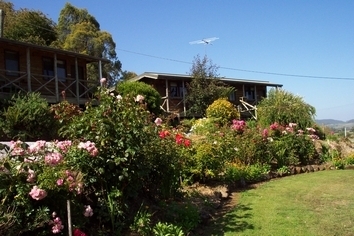 Rosewick Cottage offers self-contained farm stay accommodation at Mole Creek, in northern Tasmania.